When designing a high-traffic environment, noise is bound to be a distraction for those seeking quiet. Thanks to PSFK's recent look at sound-absorbing options, we're presented with a couple modern choices to make your space more peaceful. 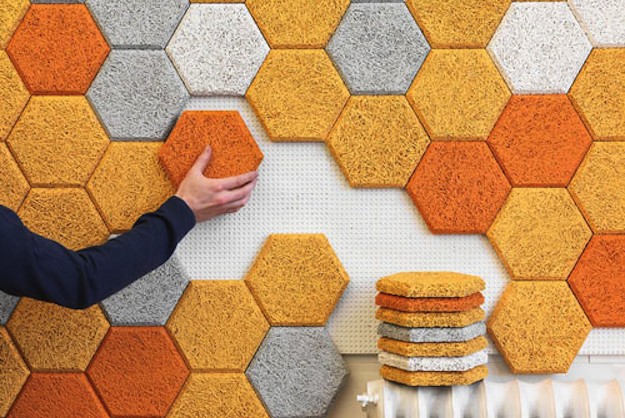 One example is to install Form Us With Love's Hexagon sound-absorbing panels (shown above). Each tile is made from wood wool, a strong and sustainable material made out of wood, water and cement. The tiles can be rearranged across your walls for sound balancing. Another option is Feltone blinds, produced by Japanese company Tokyo Blinds. These window blinds are made of sound-absorbing felt and look like standard blinds while costing 90 percent less than similar soundproof paneling. If you're ready to take the next step towards refuge from noise, you might want to consider these products as a start towards effective and easy sound absorption.